Returning to a work in mid-process is a common trick for jump-starting studio time. This weekend I tried to resurrect a creation that has been sitting on my bench for months. This brooch has been a trial from the beginning. Don't get cavalier with your medium. Just when you think you have it mastered, new issues will arise. Cutting two pieces with the same template doesn't guarantee that the clay will dry evenly so that they match, and irregular shrinkage in the kiln can undo even greenware ministrations to fix the issue. Clay has memory, and repeatedly working it leads to trouble. Handle as little as possible. Mistakes are opportunities. Repeat this statement as often as possible when Resistance strikes. Lots of mistakes mean lots of opportunities. 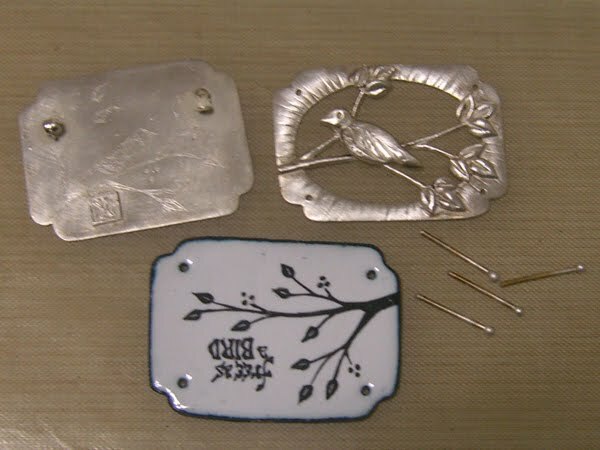 If the silver pieces don't match, there could be an insert showing to give a new edge and extra design options. If the enameled text on the insert bleeds into a huge black blob, it's an opportunity to learn to remove enamel from copper. Or an invitation to improve speed in fabricating a new blank with saw, file, and drill. New ideas near completion may conveniently be accompanied by mistakes to insure that there is an opportunity to experiment. Take a deep breath. Maybe the day's work is done. But tomorrow's work will be to back up and try out that new idea. How lovely that the pen work did not bleed on the second try ... but the background is boring. Naturally, the nature of those riveted holes will guarantee that the upside down artwork will be removed a second time. Laugh. And then get back to work. Resistance is a sign that you are on the right track.